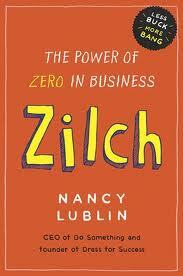 In Nancy Lublin’s new book “Zilch,” she suggests asking the following questions to make your brand strong, better and more authentic to customers. 1. If your brand were a car, what kind of car would it be? What color? Old, new, used? What price point? Would everyone in the company have a similar answer? 2. Can you describe your brand as the first, the only, faster, better or cheaper? If not, you’re toast. 3. Who is your brand relevant to? Describe him or her in as much detail as possible. How old is he? How does she spend her day? Her nights? Weekends? 4. Ask your office manager, your receptionist, and your cafeteria serving staff to describe your company in one sentence. Those people are your frontline soldiers who hear and see every department, at every level. Really listen to how they answer the question. 5. When was the last time members of various work teams, at diverse levels of the company, spend more than two hours together just looking at data and talking about the brand — without a specific brainstorm topic on the table? 6. Who are your five most visible partners? What do you think your target market thinks of them? 7. Do you have standards for selecting partners? Are they based on multiple elements or just on price? Size? Convenience? 8. How does your mom or husband or child describe the company where you work? Is it a more simple and accurate description than the one you’ve been instructed to recite? 9. Do you have written brand guidelines for your company? A booklet? A one-page memo? An e-mail that was sent “to all” last year? Who wrote it? How was it put together? 10. Are there words that are nevers for your brand? (For example, in soccer you never use your hands unless you are the goalie.) Do you have banned words? Should you? 11. What does the data say? When was the last time you asked yourself this question? This entry was posted in Consumer Insights and tagged brand, Consumer Insights, Nancy Lublin, values, vision. Bookmark the permalink.